Now you or your loved one can sit down or stand up from your favorite recliner or sofa with ease and comfort. The CouchCane is a must have for anyone with impaired balance, back pain or recent surgery. Now you or your loved one can sit down or stand up from your favorite recliner or sofa with ease and comfort. The CouchCane features a sturdy, ergonomically designed handle and a handy Organizer Pouch, perfect for keeping convenient items close by. 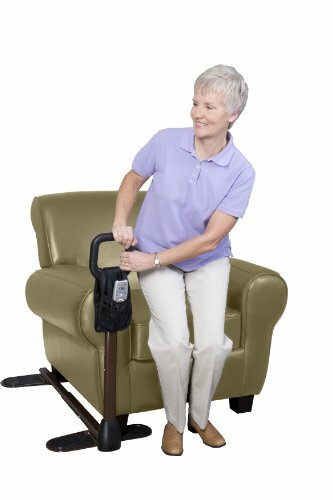 The CouchCane is a must have for anyone with impaired balance, back pain or recent surgery. Super grip rubber pads - ensures extra stability and protects floors against damage. Also works great with a lift chair!. Dimensions of Handle: 6 inches x 6 inches 1.25 diameter.